Growthpoint Properties Australia sold an A-grade office building at in Nundah, Queensland, to Centuria Property Funds for $106.25 million. The 12,980 square metre Nundah property at 1231-1241 Sandgate Road, which is fully leased to tenants such as Energex and Powerlink with a weighted average lease expiry of 9.3 years, was sold at a 6.9 per cent initial yield, according to the Australian Financial Review. The AFR said Growthpoint purchased the property in 2011 for $77.9 million and will settle its sale to Centuria in early July. Growthpoint reportedly also sold a 8680 square metre office building in an industrial facility at 29 Business Street, Yatala to a private investor for $10.65 million. The property is leased to CMC Steel Distribution. Together, the sales were part of Growthpoint's plans to reduce debt and rebalance its portfolio towards offices, following its GPT Metro Fund takeover in November 2016. Growthpoint's gearing ratio, as a result of sales, was reduced to 39.4 per cent and completes the company's capital management initiatives for 2017, the AFR said. Centuria Chief Executive of unlisted property funds Jason Huljich told the AFR that Sandgate Road is located in a high-growth area of Brisbane where more than 1000 new dwellings have been built over the past four years. "There is also the added benefit of expected capital growth, as Nundah continues to expand and the Brisbane office market improves," he said. Centuria in turn will place the Nundah property in a new unlisted fund, the Centuria Sandgate Road Fund. 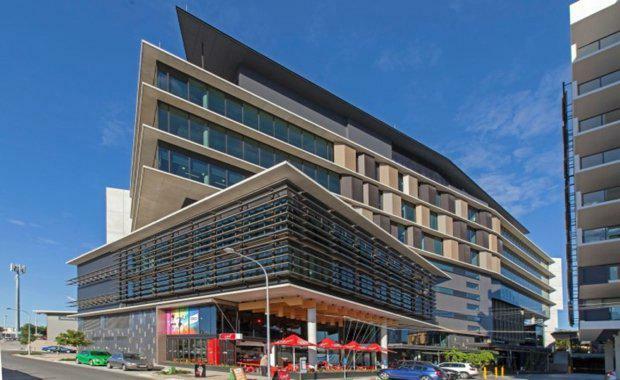 Growthpoint has sold an additional $322.8 million in property including an industrial portfolio in Victoria to Singapore's Mapletree Logistics Trust for $142.2 million. The AFR said CBRE's Flint Davidson, Bruce Baker and Tom Phipps handled the sale of the Nundah property. "The initial term of the trust is six years, with a forecast distribution of 6.5 per cent in the first year and 7 per cent in the second." Both sales have reportedly exceeded their respective book values at December 31 by about 3 per cent.